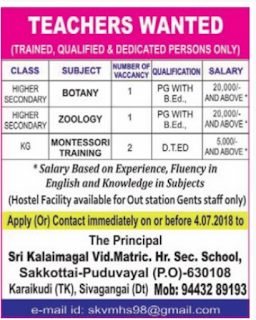 Sri Kalaimagal Vid.Matric.Hr.Sec.School, Sivagangai has advertised in the HINDU newspaper for recruitment of Teaching Faculty-Fresh and trained, PGT jobs vacancies. Interested and eligible job aspirants are requested to apply on or before 04.07.2018.Check out further more details below. Name of the School :Sri Kalaimagal Vid.Matric.Hr.Sec.School, Sivagangai. 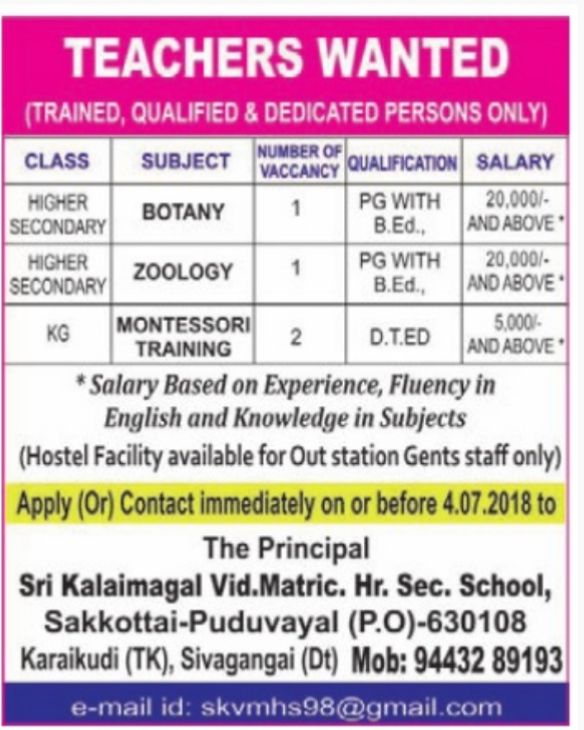 Salary based on experience,fluency in english and knowledge in subject. Hostel facility available for outstation Gents staff only.